Sigiriya is a very well-known destination for tourists in Sri Lanka, famed for its huge and ancient rock fortress with a fascinating history. It is located in the Matale District of the island, near the town of Dambulla in the Central Province. Yet despite the multitude of tourist hotels, guest houses and restaurants in Sigiriya, there is a significant level of poverty and unemployment in the area. 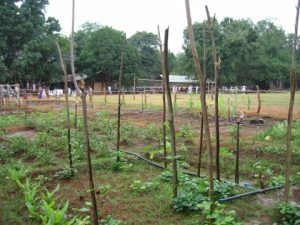 Project Sri Lanka was asked by the Sarvodaya organisation if we would support the development of an innovative school garden project at Ilukwewa Junior College which is situated very close to the centre of the village and the rock. We agreed that this was an excellent project and have been delighted to follow progress. In 2018 the project was visited by the Trustees and formally launched. We have provided equipment for clearing land and fencing to protect the crops from wild animals such as elephants and monkeys; funding for a water pump and sprinkler system, tools and plants. This is a very exciting development in the school. The pupils have prepared the ground supported by staff and parents and are now planting and tending crops. They often attend at 6.30 am before lessons start and at weekends to work in the garden. 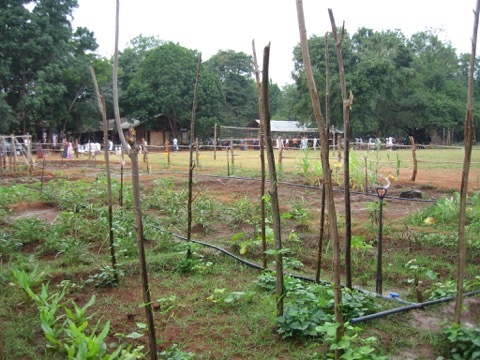 They have planted small mango trees and will gain so much from watching them grow and mature. Other crops grown include potatoes, aubergines, passion fruit, beans, onions and corn. This school project is important for three fundamental reasons. Firstly it is hugely educational and the pupils will learn a great deal about the origins of our food and how it grows. Secondly, it is excellent for the health of the pupils and their families as they will consume ‘home grown’ vegetables and fruits, free of pesticides and additives. Thirdly, it will be of economic benefit since surplus crops can be sold and income generated can be channelled back into developing the farm.